Words can't express my love. How cute are they!? Happy Birthday to the big 5 year olds!! They are dolls! Happy Birthday Girls!! Happy birthday to your cuties! They are so beautiful! Happy Birthday! Happy birthday to your beautiful girls! My daughter will be five next month! Oh, how time flies! Oh, so cute! Happy Birthday to your beautiful girls! they are the cutest little girls, ever. happy birthday to them! hope you guys have an absolutely wonderful day! Happy Birthday to them! I hope you all have a fabulously fun day!! They are Adorable! Happy Birthday to them! They are SO cute! Have an amazing day with your beautiful girls! Happy Birthday girls. They are beautiful, congrats to mom and dad. They grow so quick, my oldest just turned 8. What did we do before kids? Your girls are so adorable! Happy Birthday to them! What adorable photos of your little buddies. I hope you have a fun day celebrating their birthday. Enjoy. happy birthday to your girls!! they are beautiful. Happy Birthday!! They look very excited to be 5! Such beautiful girls... you are so blessed! Happy Birthday to your sweeties! They are such gorgeous little girls. Cason had better get his guns ready for when the boys start calling! Hope you have fun celebrating! Five is SUCH a fun age! Happy Birthday to your beautiful girls! they SERIOUSLY could not be more gorgeous!! Have fun celebrating. Wow. 5 years. We're hitting that with our oldest in June. You have the prettiest girls ever! So cute! I hope their birthday is full of fun! Oh my goodness, you have the sweetest little girls ever! Happy birthday darlings! Happy Birthday Girls!!! they are SO beautiful!! They are tooo cute!! And I love the way you dress them. Happy bday girls have a great day!! Those pictures are adorable! It looks like fun to have twins. Happy birthday to your girls! They are adorable! they are sooooo adorable! happy 5th! and wow, have they mastered the mommy expressions- shelly, they are mini yous! Happy, happy birthday to two darling girls!!! Your girls are beautiful! I have twin boys who will be 5 on the 23rd. :) Happy birthday to your girls! Aww, happy birthday to them! And happy mom anniversary to you! Your girls always look so sweet. OMG...your girls are absolutely gorgeous!!! Two little models you have on your hands, young lady...;) Happy Birthday to them! Happy Birthday Girls!! They are adorable! Happy Birthday to your girls! They are adorable. Love your blog! Enjoy your party! Your girls are so beautiful! Enjoy celebrating them today! They are adorable!! Happy 5th Birthday girlies!! They are GORGEOUS little angels!!! WOW!! GREAT pictures, Shelley. =) HAPPY BIRTHDAY, girls. Shelley - seriously do you and your husband just already have anxiety about having to lock up all 3 of your beautiful daughters as they get older? They are STUNNINGLY gorgeous. Even my 3 year old saw their pictures and just said, "Ohhh those are the most beeeeuteeeful princesses Mommy". I hope you all are enjoying their big day!!! Happy Birthday to your beautiful princesses! Beautiful little Girls! Happy Birthday to them! What a great day for a birthday! My sweet boy Sam turns 3 today. What a blessing children are. Hope your adorable girls have fun on their special day. Thanks for sharing all of your talents with us! Precious girls. Their hair looks so CUTE! Adorable! I love their locks! SO FREAKIN' CUTE! Have a happy day girlies! happy birthday girls! same bday as my son! They are so adorable, it almost makes me want twins. Almost! But then I think about not sleeping for months and other problems I personally would have and am glad to be having one baby! What beauties! Happy Birthday to the beautiful Smith girls! what pretty little girls! Yeah! Happy Birthday ladies!!! Such little dollies!! Happy Birthday to them! They are seriously cute, and I am loving their hair!!! They're SOOO cute!! You have a talent for the girl hairdos, they always look adorable! I have identical twin girls that will turn ONE in a few days. (so glad to be past this first year!). My girls are blond and blue eyed also, hope they turn out as cute as your two! Honestly, they are gorgeous! Congrats on making it to year five, haha! They are so cute. My boyfriends daughters 5 in 2 weeks. It was amazing how fast she grew up even in the last 6 months. They are beautiful. And lucky to have a mom that is so involved! OMG, they are SOOO CUTE! I hope that you have a great time celebrating!! Ummm, looks like they got their mama's personality! Lovelies! Adorable. Happy birthday to the girls. Time sure flies--as I'm sure you've noticed! Glad you are enjoying each day. You have the most adorable little blessings running around your home. Have fun enjoying their day with them! They are beautiful! Show stoppers! Can't wait to see what fun yall have planned for the birthday. Happy Big #5 to your darling daughters! I hope the day was filled with cake, ice cream and balloons! They are gorgeous little girls! They are so stinkin' cute. Love the attitude in the pictures. Happy Birthday to your Chicks! They are just darling! Hope they had a fabulous birthday!! they are absolutely gorgeous-hope '5' was a blast! Those baby girls are beautiful....they look like their momma! Enjoy the day! great pictures! they are the sweetest things ever! Could your girls be any cuter?? They are beyond adorable! They really look like you too. Enjoy 5 it ZOOMS by so fast!! Happy Birthday, Those are some chute chicks you got there!! i am a new fan of your blog. you are awesome, hope you have a wonderful day with your girls. What a couple of sweeties! Happy birthday! Double cuteness....enjoy 5...mine are 20 and 17 and I'm not sure how they got that old so fast..! 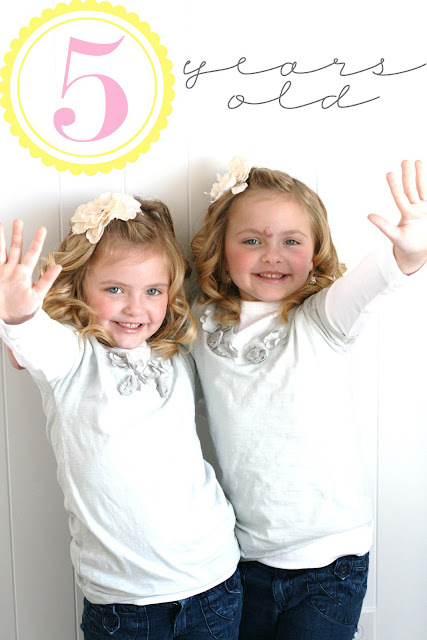 Happy 5th BDay Smith Chicks! Cute. What a fun day! What beautiful girls! Happy Birthday! I just looked at your blog today. Sorry I missed yesterday but it was my birthday too. A few more than your darlings..60 more to be exact. Tell your precious girls the 17th is a great day to have a birthday. They are so beautiful. Your should be so proud. Can I just say, you're girls are DOLLS!! I can't wait to have some little girlies of my own! Somebody else has valentine tattoos on their sweet little girls' hands! My girlie had hers all the way up her arms. I would've taken her for a biker had they not been Spongebob and cute puppy tats! Adorable little ones you have, miss! Ok Shelley....your girls are absolutely gorgeous!!!! The pictures are beautiful. Did you use a professional to take these pictures? Bug Hugs! they are adorable!! love their flowers!! What beautiful beautiful gals :) Happy bday! Oh my goodness! They are absolutely positively ADORABLE!!!!! Happy Birthday! Happy belated birthday to two beautiful girls! I had a mini break down when mine turned 5.. and they are going to be 7 in November?! Where does the time go? Hope they had a great day! Happy Birthday! They are such beautiful little girls!!! Your photos look AMAZING!! I felt a great sense of pride when I saw those images. Your posing is darling, you lighting is awesome. Really great job!! Your girls are adorable!! Love the pictures!! Can they be my best friends too? !